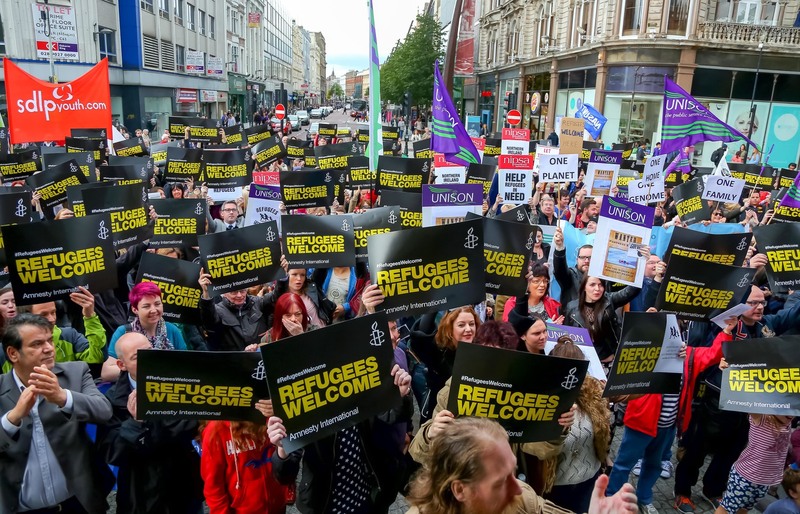 Rally for refugees in Belfast last month. Photo by Press Eye. DETAIL Data has spoken to people seeking asylum in Northern Ireland. They have all been in the asylum process for more than three years and asked not to be identified. AS the chair of the Northern Ireland Community of Refugees & Asylum Seekers (NICRAS), Justin Kouame spends his days helping destitute asylum seekers with housing issues, legal advice, food donations and general support. In the six years that he has been volunteering with NICRAS – the only refugee and asylum seeker led organisation here – he has helped hundreds of people from countries including Somali, Zimbabwe, Syria, Iraq, Iran, Sudan and Egypt adapt to life in Northern Ireland. And as an asylum seeker himself he has first-hand experience of the system. He arrived here from the Ivory Coast in 2009 – and is still in the asylum process. He also believed Northern Ireland is not adequately equipped to deal with the plight of asylum seekers who have fled their counties because of conflict, war, sexual abuse, political beliefs, persecution and female genital mutilation. Problems he cited include language barriers, poor quality housing, hate crimes and a lack of trained immigration advisers/solicitors. The Home Office has, however, highlighted the provisions made for the welfare of asylum seekers. A spokesperson said: "Asylum seekers and their dependants are provided with accommodation and a weekly cash allowance to cover their essential living needs. The allowance levels are reviewed each year to make sure they are sufficient to cover essential living needs." NICRAS receives funding from Office of First Minister and deputy First Minister (OFMDFM) through the Ethnic Minority Development Fund. One woman who is being supported by NICRAS said she was “forced to flee Zimbabwe”. She is still in the asylum system after seven years and dreads what the future holds for her and her two-year-old daughter who has already had open heart surgery. “It’s difficult moving from one place to another and not knowing what the future holds. It’s very confusing for my daughter,” she said. She was refused asylum in 2011 and is still in the appeal system. A second woman, also from Zimbabwe, has been waiting 18 months for her second Home Office interview. She said the process was “daunting”, “slow” and made her feel like “a criminal”. The single mother is also reliant on NICRAS for weekly food parcels and baby products. Another man from Kenya, is now homeless after his application for asylum was refused. He also lost his appeal and is exploring other legal avenues. The 29-year-old said that if it wasn’t for groups like NICRAS and the Welcome Organisation he would be without food, water and hygiene facilities. Meanwhile Reuben Black from Ballygowan has spoken to Detail Data about the plight of refugees arriving in Greece. The 18-year-old is currently in Mykali Beach, Samos, volunteering during a gap year. “Once a week for the last six weeks we have been going to serve basic food, water and sanitary supplies at the port in Samos where the refugees are registered and then wait for their boat to Athens,” explained Reuben. One of the refugees that Reuben assisted was a Syrian woman in her late sixties. She had left Aleppo because she ‘lost her three sons to Assad’ and it was too dangerous for her to remain in the country. The teenager added that although some of the refugees had mentioned seeking asylum in the UK, and even Northern Ireland, many believed they “will not get in”. See Detail Data's main story on asylum here.